We love making great ciders! All of our ciders start with tree ripe fruit that we carefully crush and ferment. Often unsightly and a challenge to eat fresh, the French, English and old American cider apple varieties we grow to make our ciders carry intense aromatic flavors that shine through fermentation and aging. As the cider ages through the cold snowy winter, the bitter tannins that made the fruit so edgy while fresh give way to soft, complex and surprising flavors that linger and evolve on the palate. Our ciders are best served at a cool room temperature. They pair well with a wide range of foods. Our favorites are aged cheeses, fish, pork, and cured meats - see where your creativity leads you. Winter Tasting Room Hours: by appointment through February. To schedule a tasting, call (509) 630-3507, or email below. 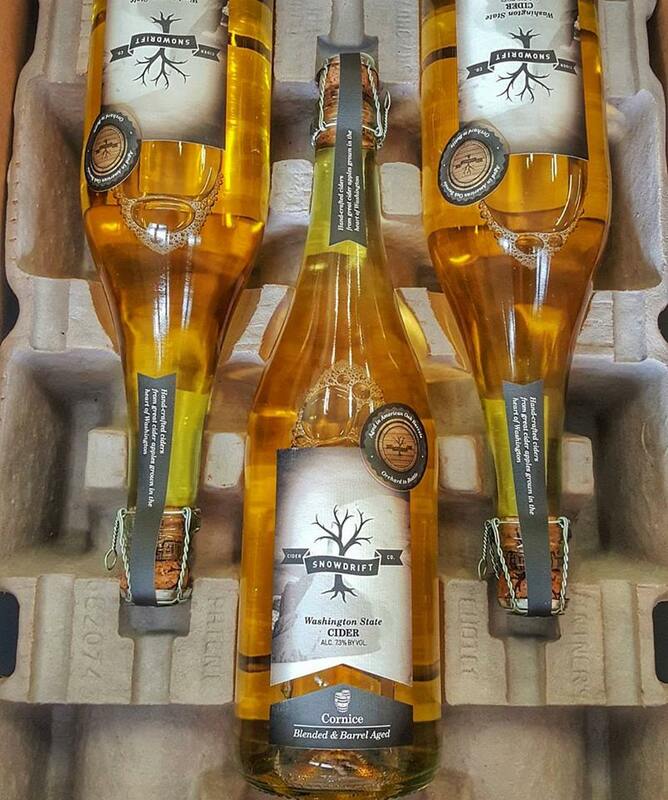 You can taste Snowdrift Cider at Wenatchee Chamber Tasting Room downtown Wenatchee 7 days a week.